Harris Museum & Art Gallery held little information about the painting 'Figure with a Book and a Quill Pen'. The canvas was dirty, the painting bore no signature, and a stretcher bar had ‘SMITH/181347/48/48/STORED’ written on it. The painting was thought to be dated mid-to-late 18th century. As the painting resembled a portrait of Saint Lucy in the Ashmolean Museum, the collection sought further information from Art Detectives about its identity. Jochen Suy began the discussion by commenting on the figure’s pose: a reminder of Saint John the Evangelist. 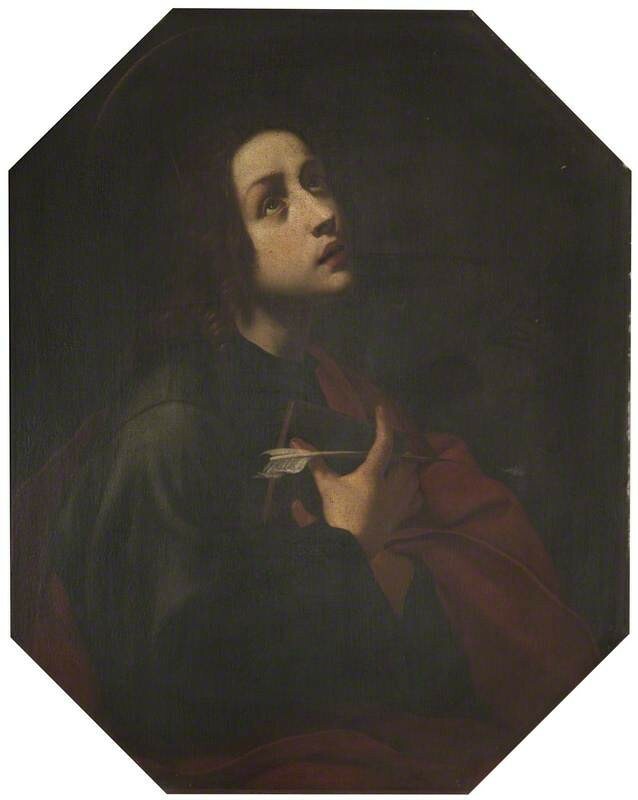 Toby Campbell agreed, adding that it looked like a portrait of Saint John based on the portrait of Saint Lucy by Dolci or one of his followers, perhaps Cesare Dandini. Saracino Francesco confirmed the painting depicted John, drawing attention to the book, pen and that the figure wore Saint John’s colours, green and red. Previous paintings on this subject were different, so Saracino suspected the painting was probably by a later Florentine painter inspired by Dolci. Martin Kemp thought the painting was a stock variant on depictions of Saint Lucy, given a pen to look like Saint John, and queried the hand position. Tim Llewellyn, supporting the discussion so far, agreed the subject was almost certainly Saint John, but the distinctive eagle mark on other versions of the subject by Carlo Dolci was not present, so was unlikely to have been painted by the artist. Victor R. Veronesi produced an online source from which he thought the copy was made. However, Richard Green thought the source was a derivation, rather than the original, of which the Harris Museum & Art Gallery picture was probably a copy. Thus both works point to a common source – a lost, or unlocated prototype by Carlo Dolci. Tim Llewellyn ended the discussion by agreeing that the painting depicts Saint John the Evangelist, and is a copy of a work by Carlo Dolci. The collection were happy to agree to the changes suggested. Could this painting be a copy, or studio version, of Saint Lucy by Carlo Dolci?